Although I like music and I'm into the whole mp3 thing, I've never had an mp3 player, so it was interesting to review the Samsung YP-T9J. I couldn't compare it to an iPod, as the only mp3 device I have is a CD player. As I archive all my mp3 files onto CD-Rs, it helps that I play them directly in a player without having to transfer files to a device. 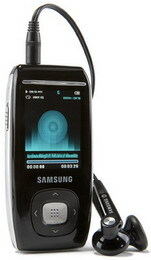 This MP3 player from Samsung plays mp3 files, wma files, videos, has a text browser, an FM radio, can view photos, has a couple of games and has a voice recorder. The T9 is small and quite thin, looking like a mobile phone (but they get smaller every day), with a 1.8 inch screen, a black finish (apart from the sides which are silver with a few buttons), and a silver button on the front. The headphone socket is on the top, along with the microphone for the voice recorder, and the USB connection socket is on the bottom, using a flat non standard socket, that fits the cable supplied. You also get a set of headphones, but you can use any set with a 3.5 inch jack, or a Bluetooth headset (did I mention it has Bluetooth as well?). The button on the left of the player is for hold, and on the right there are four buttons for turning the device on/play/pause, menu, back and A-B repeat/record. I did get a bit confused as to which button to use, but after a while you get used to the position of them. The animated display/photo/cover art feature is okay, but I found once I started playing music, I wasn't spending time looking at the display. When you play music on the device, you have a choice of three animated displays that move in time with the music, a photo or the cover art for the music. MP3 files can have a jpg embedded in them, and the device will display it if available. I had some trouble with this, until I found out that it will only display the graphics if the picture is under 200 pixels in size. Several files I had transferred across had pictures embedded, thanks to either the latest version of media player or one of many mp3 programs for PC that can embed pictures, but because they were larger that 200 pixels, the device just showed a graphic of a pair of headphones. The user interface system requires that you are on particular screens to do certain things, which often means pressing the 'back' button several times. I had been using the device for only five minutes before I had to look in the manual to work out how to do something, but even that was tricky. You only get a Quick Start guide, which is one of those three page types in several languages, and no physical copy of the manual. The PDF Manual is on the CD, and the autorun for the disc gives you the option to read it, as well as install the Media Studio software used to transfer music, along with the driver for the player itself. There's no link to read the manual on the Start Menu as it is not copied to the hard disc at all. How do Samsung expect you to learn how to use the device if they make the manual difficult to read? There are ten sections on the T9, each with its own icon, selected from the main menu: Music, File Browser, FM Radio, Text, Photo, Video, Game, Record, Bluetooth and Settings. In the Music section you can list the tracks on the device by Artist, Album, Track, Genre or Playlist. This is according to the ID3 tags, so it's important that they are set correctly before the mp3 files are transferred across. There are some options when playing music, such as Street Mode (which "allows you to hear music more clearly outdoors," or rather, increase the volume, DNSe (a selection of EQ and "3D surround-sound" settings), Play Mode (Normal plays all tracks in order once, Repeat repeats the current folder you are playing, Repeat One repeats one file, and Shuffle is self explanatory), Play Speed (which gives you a plus or minus scale of 3 to increase or decrease the speed and pitch together) and Skip Interval (which controls how far ahead the skip button jumps). The headphones supplied are not of high quality, and almost as compensation, there are 3D and virtual sound options. These settings try to improve the sound quality and the feeling of space, but it just sounded like the music was played in a large room, with strange acoustics. There is no substitute for a decent set of headphones, whether a standard type or in ear variety. When I used to listen to music on my Walkman, MiniDisc and then CD player I would invariably use the more expensive lheadphones that I bought separately, leaving the ones supplied with the unit in the box. The File Browser does just that, choosing from Music, Text, Pictures, Video, Recorded files or playlists. If you have a compilation album or a set of files in one directory, this is the easiest way to play them. The FM Radio works well, with the ability to store frequencies as presets and display station IDs where possible. It's been a while since I'd used an FM tuner, as I tend to use my Freeview box to listen to digital radio, and I only managed to pick up six stations. I would have thought that in a modern device you would have a digital radio, but the FM one worked as good as expected. Text files can be viewed in portrait or landscape. You can set a colour scheme (the same choice you have as the overall interface scheme) and you can bookmark the text, so you can go back to a particular part of the text. Photos can be transferred to the device and are converted to jpg, but you do have some control in the size and quality of the file. You can browse the pictures with a three thumbnail view or full view, but like the video playback the display is really too small to see any great detail. There is no memory card slot (unlike my Pocket PC which has an SD and CF slot) so any photos you want to put on the device will have to be transferred from your PC. Video playback on the T9 is a bit of a disappointment. With the screen so small you can't really see much detail. It's the same with mobile phones, but I'm of the old school that thinks you should just use you mobile for making telephone calls and not playing music, taking photos, surfing the internet, watching video, etc. The screen is 208x176 pixels in size, which if you work it out is not a 4:3 ratio. 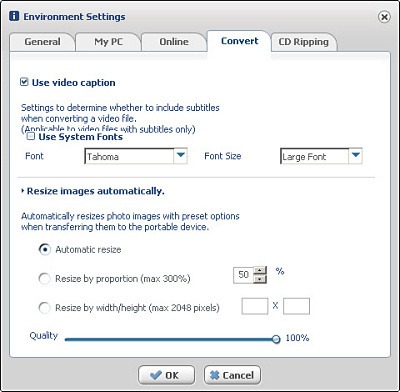 Videos I had converted to wmv to watch on my Pocket PC (which has a screen twice as large) would transfer across with the software, which automatically converts the file to SVI format (that's an MPEG-4 type with MP3 audio at 128kpbs). When I played them back on the T9 the video was stretched vertically, so everyone was a bit thin and taller than normal. All video files are converted to the full screen size, so if you transfer a widescreen video the playback would not have black bars and the image would be very distorted. One of the two clips included on the device was a Samsung commercial obviously filmed in widescreen as the playback showed everything squashed. Now I know the software isn't intended to replace video converters, but the lack of any control over the aspect ratio is of no help, especially when one of the clips meant to demonstrate the playback facility is wrongly sized. If I wanted to watch anything correctly on the T9 I would have to render the video to allow for the distortion, and then let the software convert it again when I transfer the video file across. You can bookmark parts of the video, but as it just doesn't look right on screen, I wouldn't watch anything for a long period. In the Games section there are two games included on the T9, Baseball and Pizza Delivery. They are both fairly easy to play as you don't really have many controls to play with. They look almost Japanese in style and are built into the firmware of the device. I found them quite limited in their appeal, especially as there is no way to add games to the collection. You could have a wide variety of games as the device can play the Shockwave flash file format (the games are based on this format) but several of those games I've seen would need a mouse-like control on screen, which the T9 does not have. The Record section, or rather, the voice recorder, is very easy to use and you can set the mp3 bit rate to 96, 128, 160 or 192 kbps. You can also record from the FM radio, and set a different bit rate for that as well. The microphone is quite sensitive and works great if you are just recording a voice. The Bluetooth functions only really work with Bluetooth headset, which I didn't have. You can't connect to your PC with it and transfer files but you can use Bluetooth to connect to a Samsung mobile phone. The Settings page allows you set the button sound on/off, the colour scheme of the interface, brightness, set the date/time, and other details. There's also an option for a Sleep Timer, which will switch off the device after a certain time. On the PC, the Samsung Media Studio program is not the most stable of software. It can automatically start when the device is connected with the USB cable, but you have to add music to the collection before transferring it. You cannot just browse to a folder where your mp3 or wma files are and drag them onto the device with the software itself. It also seems to think that you will use the software to play your existing music collection on your PC. As I said before, I archive my mp3 files to CD, and I did manage to select the CD drive as a folder, and so transfer music from the CDs to the device without adding them to a library. Unfortunately some of my older CDs are a little worn, and the software just froze when it couldn't read a file, instead of giving an error message. Worse than that, on a couple of occasions the player froze as well, requiring a reset through a button combination. I ran an update for the software, but that didn't seem to make any difference. On the Environment Settings dialog (that's options to you and me) part of the text does not go all the way across the dialog and partially hidden behind some text below it. It gives the impression that the software wasn't tested properly before release. Whenever the player is plugged in the lithium battery is charged, which given 30 hours of use apparently. The battery indicator only has five segments and there is no display of exactly how much power is available on the device. If you close the PC program and start it again, or plug in the device without starting the software and then launch it, or disconnect then reconnect the device, the software does not recognise the player has been connected. You have to unplug the USB cable from the player and plug it in again when the software is running. I did manage to browse the player's contents from Windows Explorer and copy and paste files, and you can also sync the device using Media Player, but this last option had a bit of a quirk. 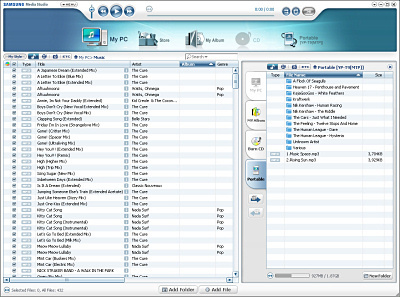 Media Player 11 (and it may also do this with older versions) created folders according to the ID3 tag information in the mp3. Nothing wrong with that you may say, but when I copied a compilation album across, instead of putting all the tracks across in one directory, Media Player created a folder for each artist, and then made another sub folder of the album name. Instead of one folder with 15 different tracks by different artists, I had 15 folders, all with a sub folder with the name of the album and then the single track inside that. I'm sure that works fine if you never want to transfer an album with more than one artist, but I found it extremely annoying. Even more so was the fact that you can't move tracks on the device, only delete them. There are three models available, a 1Gb model for £89, 2Gb model for £119 and a 4Gb model for £149. I was reviewing the 2Gb version, and whilst the device is very stylish and light (it weighs around 49g) the quirks in the way it operates, and particularly the software used to transfer files across lets it down a bit. When playing music its fine, with the big button working as a previous/next button and volume up/down, and that's all you need.